As I wandered the streets of Chinatown after a show, a mixture of thoughts about Hawaii's local metal scene started bouncing around in my head. How is it that so many bands fail at making a lasting impact here in the islands? Is it that we just lack the longevity to crack the boundaries of the national music scene? It can't be a lack of talent. Maybe it's a lack of originality? I've seen hundreds of bands play live that just seem to be cheap imitations of what's been done before. I hate to admit it but I often find myself having to bite my tongue & lower my standards with many local bands. Sure we all pat each other on the back & pay the $5 entrance fee but would we honestly go out of our way to buy their album if we didn't already know them? As a friend once told me, Hawaii's just not a very good incubator for metal music. We're not exactly descendants of Vikings who spend our days setting villages afire, we don't spend half the year in the bitter cold of winter either. I do feel a bit odd blasting Immortal's Sons of the Northern Darkness while my toes warm themselves in the sand "on a white sandy beach in Hawaii." The rest of the world sees us as an island paradise, full of palm trees & ukuleles and well, it is to some extent, unless of course you spend your nights anywhere near A'ala Park or Hotel Street after midnight. Maybe this is where my love of heavy music stems from. Too much plastic, sugar-coated Hawaii. Too many paintings of coconut trees on hotels, in place of where they once stood... but now I'm rambling. It could make for some great song lyrics though. I was at a photography meet a lil' while back and one of the folks I met there asked me about the kind of photography I dig. I told him I loved running around & shooting local metal shows here. He was in shock, this was the first time he's even heard the words metal & Hawaii in the same sentence. 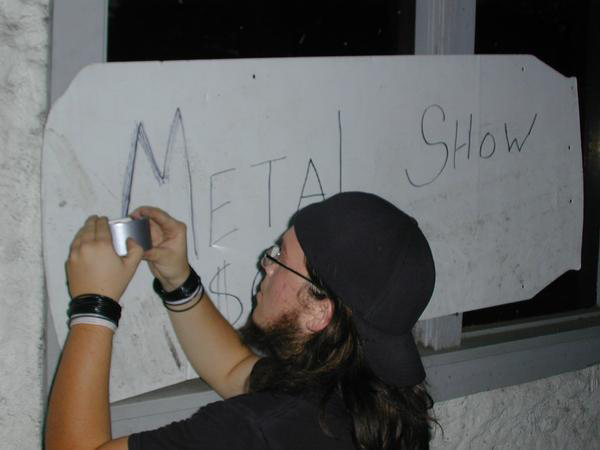 He had no clue that there was anything resembling a metal scene here in the islands. Every few days I find myself having to repeat the same explanation about what I've witnessed here; the ups & downs, the local metal scene of yore, the bands I've seen & the musicians who have left the islands only to split the second they touch ground on distant shores. Then there's the long list of bands that just aren't quite cutting it in my eyes. What needs to be done for the local metal scene to grow & thrive here? Hell, if four guys from Brazil can carve their names & their entire country into heavy metal history, why can't it be done here? Local metal bands in Hawaii need to strive to find their own voice and resist taking the easy route of following what's been done. Quality metal bands do come in waves, they just gotta hang in there long enough for the next set to roll in.